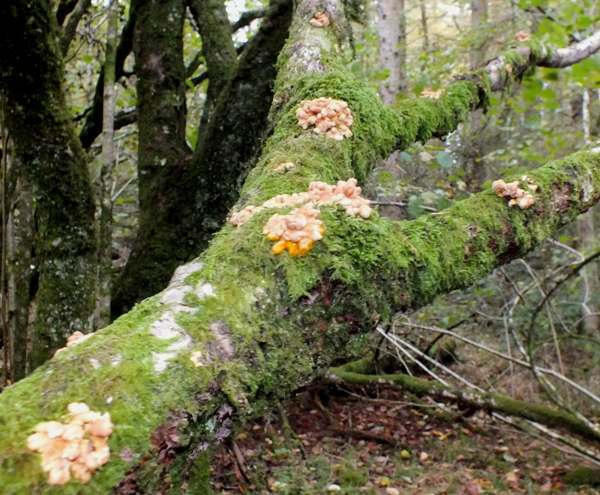 This is a rare fungus, and in Britain it occurs only on old hazel trees, often in ancient coppice woodland. The finger-like stromata of Hypocreopsis rhododendri are the origin of its common name Hazel Gloves, and indeed there is a remarkable visual similarity between many specimens of this remarkable fungus and the fingers of fawn kid gloves. 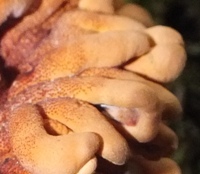 The 'Hazel' part of the name refers to the tree species upon which this ascomycete fungus is found in Britain and Europe and not to the nut-coloured fingers themselves. A rare find in Britain, Hazel Gloves fungus occurs also in parts of mainland Europe as well as in North America, where it was first described scientifically from the Appalachian Mountains of the eastern USA..
Hypocreopsis rhododendri was described scientifically in 1922 by American mycologist Roland Thaxter (1858 - 1932). I know of no synonyms of Hypocreopsis rhododendri. The genus name hypocreopsis comes from hypo- meaning under and -creopsis which may imply 'similar to snakes' - and if so it is probably a reference to the contorted fingers of the stromata of Hazel Gloves). The specific epithet rhododendri refers to Rhododendron maxima, the species upon which this ascomycete fungus was first officially recorded in North America (where it has also been found on oaks, Quercus species). In Britain there are no records of Hazel Gloves on rhododendron. 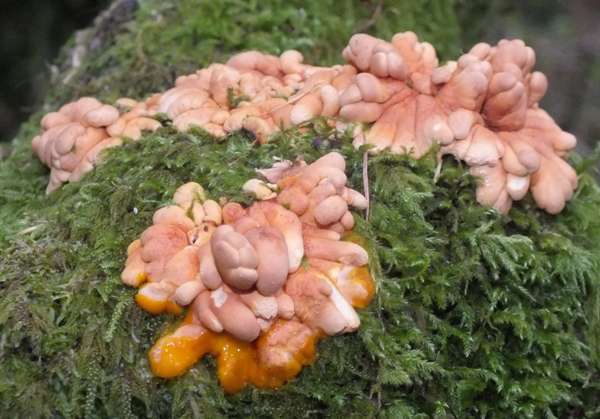 These striking fungi vary in colour from pale orange through tan to a very deep orange. Stromata can be up to 20cm across, with individual finger tyopically 1 to 2cm across and up to 10cm long. When mature, the central area of a stroma becomes brown, and individual perithecia (flasks inside which ascospores ripen within tube-like asci) embedded in the stroma become visible. 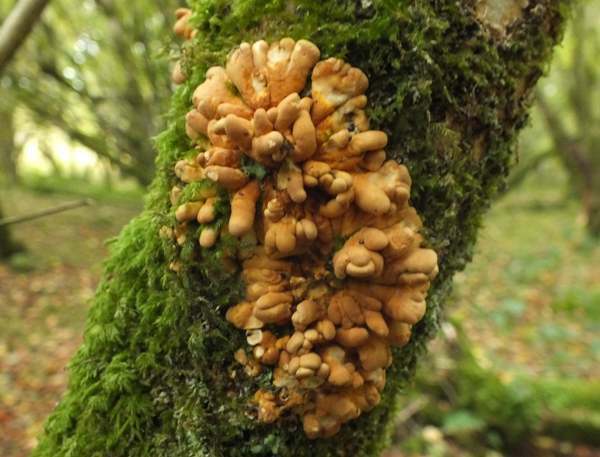 Although found on old hardwood trees - hazel in Britain - this species is believed to be parasitic on Glue Crust fungus Hymenochaete corrugata. (It is not always possible to see the host fungus, which may be covered by Hazel Gloves and by mosses. These long-lasting fruitbodies are usually at their best from August to the end of December in Britain and Ireland, but old blackening fruitbodies are often in evidence right through to the following summer, when new your Hazel Gloves begin to appear. Hazel Gloves is unlikely to be confused with any other Britis fungus except the almost-identical Willow Gloves Hypocreopsis lichenoides - even rarer in Britain - which usually has a darker brown stroma and grows mainly on willows. The two can be separated with certainty by studying the ascospores.. Although having a black outer surface rather than fawn or tan, Dead Man's Fingers Xylaria polymorpha is similar in size and shape to Hazel Gloves; it grows mainly on dead hardwood timber under the ground and is most often seen around the bases of rotting beech stumps. This rare fungus is of no cullinary interest. I don't know whether it contains toxins, but it should not be collected as it is a UK Biodiversity Action Plan (BAP) species. Ainsworth A M (2003). Report on hazel gloves Hypocreopsis rhododendri, a UK BAP ascomycete fungus (with reference to willow gloves H. lichenoides). Peterborough, English Nature Research Report No. 541. Niemelä T, Nordin I 1985. Hypocreopsis lichenoides (Ascomycetes) in northern Europe. Karstenia 25: 75-80.